Our days are getting noticeably shorter, and despite 2018 having one of the most humid summers on record, fall does seem to be in the air. Ticks in Maine, however, are gearing up for their autumnal surge. There's a lot of debate between experts as to why we may notice more ticks in the fall. 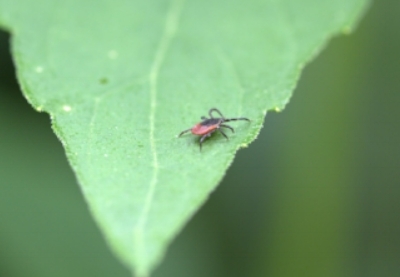 Some experts believe we may notice ticks more in the fall than the winter due to their size - they're further along in their life cycle as opposed to being the tiny nymphs we see in spring and early summer. Other experts believe that certain species are naturally more active in the fall as opposed to the spring and summer. Minimize leaf and brush piles in your yard. We know how much fun it can be for our pups to play in the leaves, but cleaning them up regularly will cut down on the places where ticks love to hide! Do regular tick checks. Check your pets (including cats!) for ticks. If you happen to find a tick that is attached, remove it carefully with tweezers or a tick removal tool. Despite what you may have heard, don't try to use unconventional methods of removing them such as burning them off with a lighter. This will only make the tick angry, which in turn makes them regurgitate and the odds of transmission of a potential disease goes up exponentially. Make sure your dog is vaccinated. Unfortunately, there isn't a vaccine for Lyme disease on the market for humans or cats, but our dogs can be protected. While not every vaccine is 100% effective, it greatly decreases your dog's chance of contracting Lyme disease from a tick bite. Stay current on preventatives. Keeping your dog or cat on a reliable flea and tick preventative throughout the fall months is one of the best things you could possibly do. Ticks are active during the fall, but fleas are too, which is another great reason to continue preventatives into the colder months. Ticks are a lot heartier than most may think, and just because fall comes with falling temperatures and frost, they find a way to keep themselves toasty warm in those leaves falling from the trees. If you follow those helpful tips above, you can help make sure they don't turn your pet into a hearty meal!